Here's a card I made for my next box of Cards for Hospitalized Kids. I used an image & sentiment I stamped at a friend's house, possibly Inky Antics? I just loved the sentiment so I stamped off a bunch of them to use on kids cards. I used a panel of pool party for the background color, and you're getting a sneak peek of SU! 's new Arrows Textured embossing folder that's coming in the new Occasions catalog. I hand-cut the sentiment panel, and used SB square dies for the image which was colored with Copics. I added a little slide-on clip and some twine for a fun accent. Love that embossing folder! I already see it in my future too. Very cute card Carol and such a precious little image. Great card. Hope you have a wonderful New Year! So cute!! Have a safe and happy new year! Look at that little face, so cute. Great coloring and I think I am gong to like that arrow embossing. I adore that sentiment. I have one similar. I'm glad you used it for the kids, I will do the same. What a sweet card! I love Inky Antics stamps and don't nearly have enough of them. There are so many great things coming out of the new SU mini... I'm gonna need another job. Or a sugar daddy. Happy New Year Carol!!! LOVE that new embossing folder! 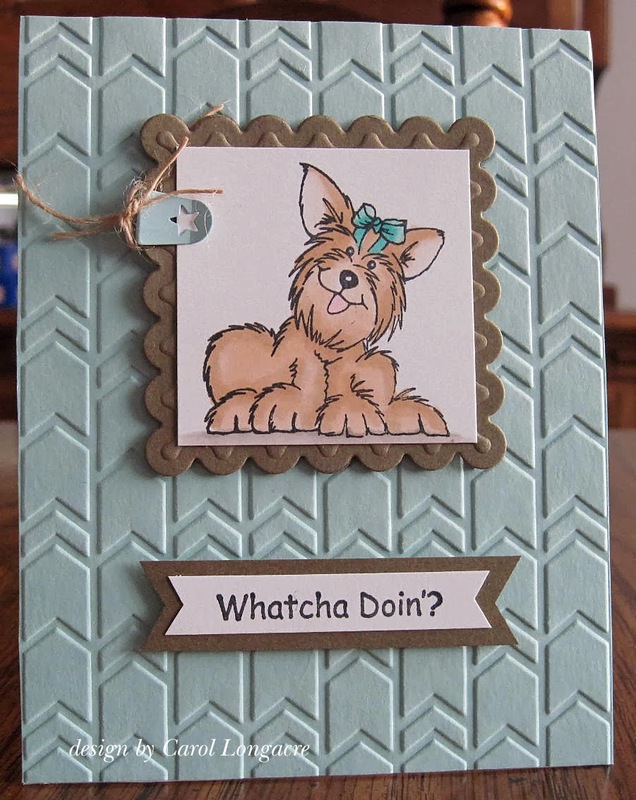 Darling little doggie card!